I don’t know if I can control it much longer. This insatiable need to kill the only good thing in my life. But this isn’t her story – it’s mine. Jenny: Wow! What the eff did we just read? Didn’t this book do a number on me! Whilst this may have been a short story, it certainly packed a punch and completely knocked me sideways. I was drawn into Whiskey and a Gun from the very first paragraph and was transfixed in horror until I finished it. We had NO idea what to expect with this one but the synopsis sounded intriguing so in we went. I have to say this is one of the most real, disturbing, sickening and brutal stories I’ve read. I read it with dread in my stomach and heaviness in my heart, never did I rest on my laurels and I had a complete hatred for some of the characters. I’m conscious not to give too much away about this story because the shock is all part of the journey in this and Whiskey and a Gun is a prelude to The Finish, a full novel which is due for release in 2014 but what I will say is if you have an issue with reading about Domestic Abuse, please tread carefully because this book doesn’t sugar coat nor does it makes no apologies and I applaud this author for having the guts to go there. I’ve never read anything quite like it. We were pretty stunned and speechless after this one weren’t we Gitte? Gitte: Bloody hell yeah, even though I have read much worse I was shocked reading this story because of the intimacy of the domestic violence, if you will. I was hooked from the first page and at no time did I feel lulled into a sense of security nor could I relax whilst reading. I read it in just under an hour and I didn’t move, I couldn’t. The hairs on the back of my neck stood up and my heart was beating frantically because at no point did I feel safe. There was a malevolent simmering undercurrent that was waiting to burst and not knowing whether it would or not was enough to freak me the hell out! Being in the aggressors head was not comfortable it was highly disturbing and sinister. Jenny: This author has written a very clever, if not extremely distressing story told through the eyes of Carter Brooks and let me tell you….being inside Carter Brooks’ head was one of the most disturbingly horrifying hours I’ve ever spent reading. There was something sinister about this man from the start though I initially felt so sorry for him and his home situation which was absolutely tragic and deplorable. My heart went out to him as a young man. To suffer as he did at the hands of his cruel psychotic father, well, it broke my heart. In saying that, despite his suffering, I never could warm to Carter because he always felt so volatile, as if something was always simmering underneath. He made me nervous to be honest. Tawny and Carter are two very damaged individuals and their stories saddened me greatly. What unfolded in Whiskey and a Gun certainly affected me and really did upset me but I wouldn’t have missed this reading experience for the world. I know that sounds contradictory but when an author can affect me to such a degree, to make me feel so much, well there’s nothing better as a reader. I felt sick to my stomach and cried at the end. It was so tragic wasn’t it Gitte? Gitte: This book is tragic and disturbing for sure. However, it is not only tragic for the obvious reasons, rather it’s the sadness of losing the fight to regress to a pattern of behaviour, repeating it and getting off on it. The inability to realise the lapse in judgement, morality and humanity. The thrill of the high and justification of rightness. The belief in violence to control and conform. It broke my heart and I felt myself shrink into myself in my chair as I quietly read with a heavy heart and silent tears. The raging and distress came after I finished reading, down the phone to you Jenny, we needed a hug and comfort from each other for sure! GAH!!! Both Tawny and Carter’s stories broke my heart! 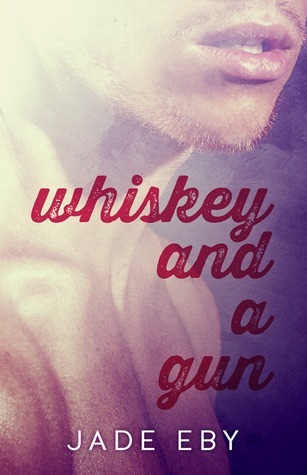 Jenny: Whiskey and a Gun unfolded in 2 year increments and initially I thought this would be too much of a jump and the story would suffer because of it but I was wrong. I don’t think I could have coped with a blow by blow build up in this story though I do hope we get to fill in a few gaps in The Finish next year. For me, what we got was enough and even though it disturbed me, I could NOT put this book down until I came to the end. Jade Eby did a stellar job of portraying the despair and pain in Tawny and Carters home lives. As a reader, taking up residence inside Carters head was shocking, I can’t imagine what it was like for Jade Eby to have his voice in her head and I applaud her for going there. She certainly put the reader left, right and centre as the horror and tragedy of this story unfolds. I’m dying to find out how where the next book takes us because I have no idea where it’s going and don’t I just LOVE that! I’m still sitting stunned, mouth agape at what I’ve just witnessed. This book shook me to my core and I wait, in anticipation to follow this story further. Wow! Talk about heavy going. Final thoughts G? Gitte: The writing style is unusual but I loved it, this Author sure knows how to get emotion across to the reader as you can’t help but feel part of the story. What I did have a problem with was the jumping of years and the lack of character development as the story was so short. I know it didn’t bother you, but for me, yes I needed that bit more to understand the transgression of Tawny and Carter’s relationship and I needed more to understand Carter’s reluctant path from where he started off to where he ended up. He was on the line from the beginning that much was obvious but what made him cross it? Unless this is being explored in The Finish of course?! I just felt that being in his head, the Author made me care for him because of his fucked up life. Then….well all I’ll say is that this book completely messed with my head. I didn’t know what to think nor could I make sense of my feelings and emotions. I became another victim in this story as its reader, if that makes any sense. So yeah, I can’t wait to read the next book and I have to say this Author’s flawless writing excites me and leaves me wanting more! I was lucky enough to read this story while it was still being written and let me tell you – it really got to me. I didn’t know if I loved it or hated it but I could not get it out of my mind and found myself talking about it with friends and coworkers. That’s the mark of a good story for me. One that doesn’t leave my mind – long after I’ve put it down. Great review – I loved your thoughts on the story and it adds to the whole experience for me!